When I was 12 years old I didn't tell anyone because I thought it was my fault and because I didn't think anyone would believe me. Of course, there was no one who could corroborate my story. Years later, I got the message loud and clear. Today, 64 years later, I got the message loud and clear. Today, nobody would believe me, or if they did, they wouldn't care. During the Senate's Supreme Court's confirmation hearings I started reading through my Twitter feed as #believeher started trending. The above quote was the one that stopped me in my tracks. In 2016, before #metoo I completed a series of paintings and conceptual pieces, Terrible Beauty, based on my own childhood experience of sexual assault. Like countless survivors, 30 years passed until I told anyone. As I went through the other comments on Twitter I came across another that hit me equally as hard. A young women railed against those who came forward so many years later, not understanding why something that happened so long ago had any impact on them now. Her final advice, Just get over it and move on. I am guessing that this young woman has not have the same experience and given that one in five women in this country have been raped and one in three have experienced some form of contact sexual violence the odds are pretty great that she may have survivors in silence in her life. As I took in all that transpired over the last few weeks I kept coming back to the hard reality that women have not been believed and in many cases have dealt with the destructive and life changing aftermath of sexual assault alone and in their own way. In my mind, the work I did for Terrible Beauty was not only hugely cathartic, but in the end was more about the effects of those years of silence as much as the event itself. 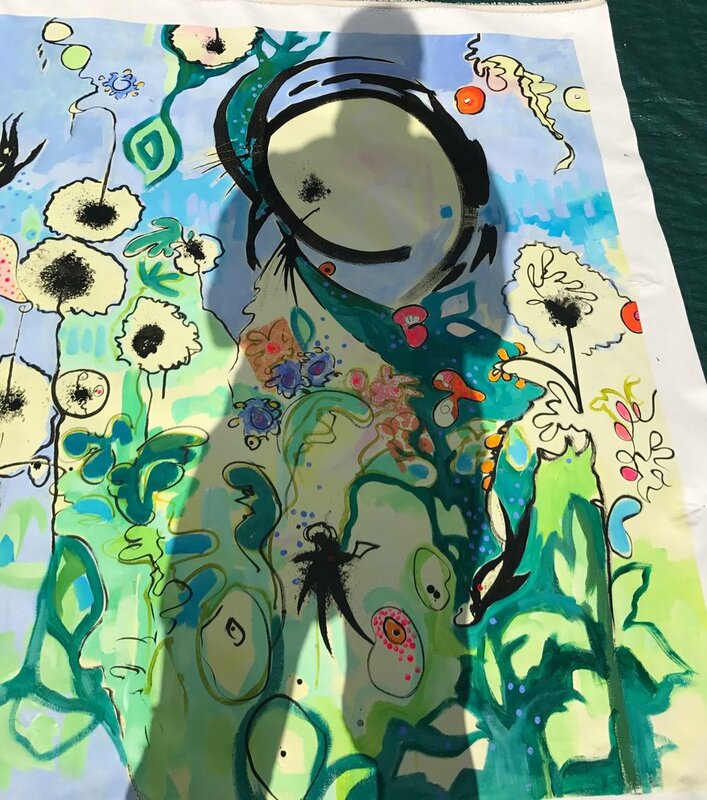 The painting Fear was My Imaginary Friend, summed it up best for me, An undercurrent of fear was always present, its tentacles reaching all parts of me, affecting every decision and idea about myself. I thought about the 83 year old women on Twitter and wondered what her silence and the festering of this most intimate of wounds would have cost her throughout her lifetime. In my studio, I had just hung a 60"x60" blank canvas, gessoed and prepped for a new painting. The plan was to paint several figures since I have just recently returned to painting with oils after a 4 year journey with mixed media. I intended that this canvas would be completely experimental to "move the paint around" and to not get fussy about the outcome. Instead, I couldn't seem to help myself as I imagined this 83 year old woman. Her narrative emerged; the girl, the woman and the witness, leaving it for the viewer to fill in the blanks. Its titled, She's Come Undone. In the end, I am hopeful that we as a country will one day look back at this painful moment in history and recognize it as the moment of pivot for things to start changing, a time when women will be believed. One of the many reasons I love summer is that I take a break from my regular studio hours and try to get out in the community. Since my teaching days I have always believed that the making of art should be accessible to everyone. 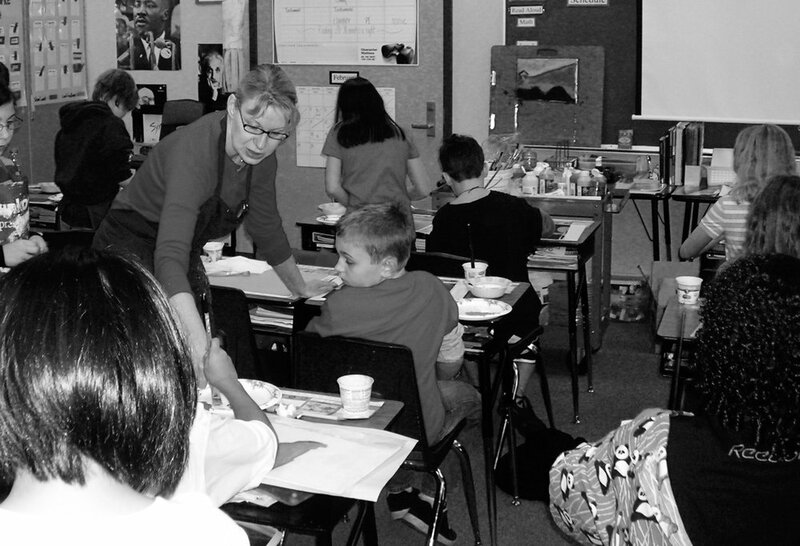 There is so much fear around the idea of creating art that could be a holdover from a bad interaction with an insensitive teacher or just a lack of experience working with materials. In the past, I have provided materials for both children or adults to work on their own projects in an experimental, stress free environment. 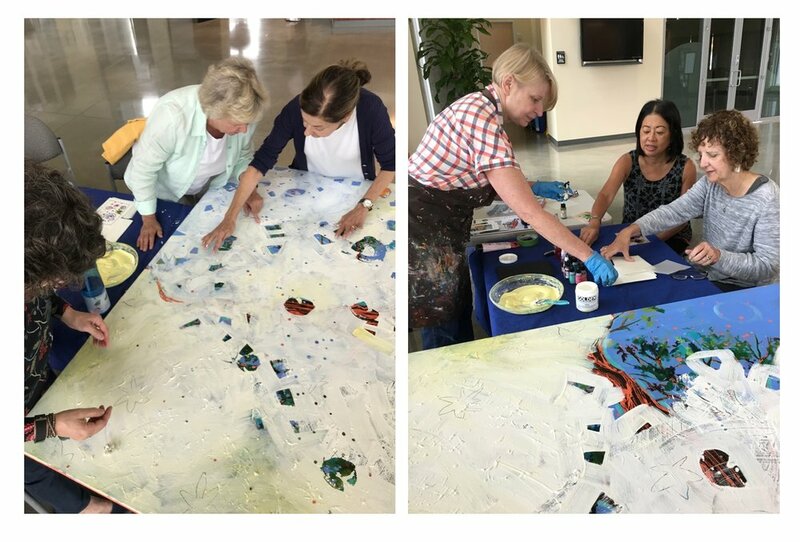 Last week, I tried something different as I worked on a painting over the course of two days in the lobby of the Shoreline City Hall. My current series of abstract work consists of many both additive and subtractive layers on top of a traditional landscape painting. It is unrecognizable in the end, however, bits show through to remind the viewer that something old is beneath the new. I had the public help in the removal of certain layers in an effort to create the experience of collaboration between artist and viewer. What surprised me was the initial hesitation to actually touch a painting. From there it was diving in with an enthusiastic engagement with the process and turned out to be a great experience for the viewer and the artist. "But there's a world beyond what we can see and touch, and that world lives by its own laws. What may be impossible in this very ordinary world is very possible there, and sometimes the boundaries between the two disappear, and then who can say what is possible and impossible." While I have made the idea of generational transition a focus of my art, we have all been marking the exit and entrance of a generation or two or three. It only took having my own children to come to the quick realization that it only takes two generations to pass before the memory of family members fade. As much as I appreciate and honor the contributions of past generations, I realize that legacy can be a two edged sword as I've been reflecting on my own generations influence on current culture. History is the final arbiter of a generation's impact for good or ill and I am afraid history may judge us harshly. I think of my children and grandchildren and the young people I have taught over the last 20 years. Except for lessons learned, the past will not offer solutions for the problems that these young ones will face. It is perhaps time for the previous generations see themselves in a new role, to step aside, to change the long held power structures and to provide all means of support to those who seek to solve the myriad of social and environmental problems. The current breakneck pace of change can only lead to something new. 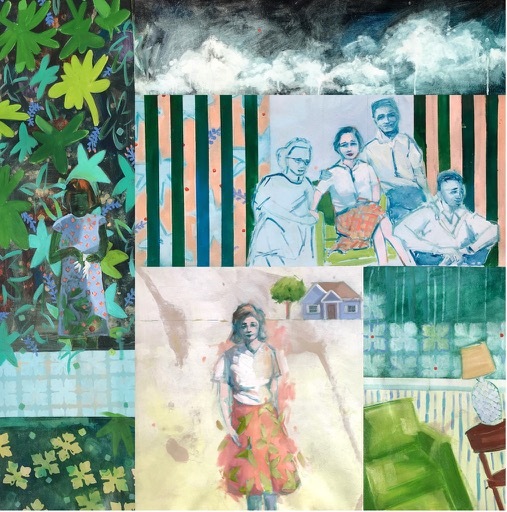 These paintings, contain a visible traditional underpainting mostly covered by painterly layers reflecting one generation's willingness to relinquish the role of power to next generation. The energetic fluid ink marks reflect change and something new to take its place. A reflection of the transition from one paradigm to the next. As for the younger and future generations this is their world that is coming and up to their imaginings to create a fair, just and compassionate society. The wisdom of the older generation will be in knowing that its their turn to listen and to stand beside. Is There a Mother in the House? Chicago was how it often is in early spring, cold, windy and wet, equal parts rain and snow. I lived in the city for three years in my 20's and was reminded of that moment you brace yourself when a strong wind hits the entirety of your body, making it seem as if it wasn't really that cold a moment ago, but now the cold goes right through, down to the bones. I didn't mind it then, but I must admit it is a bit shocking after spending so many years in the Pacific Northwest. 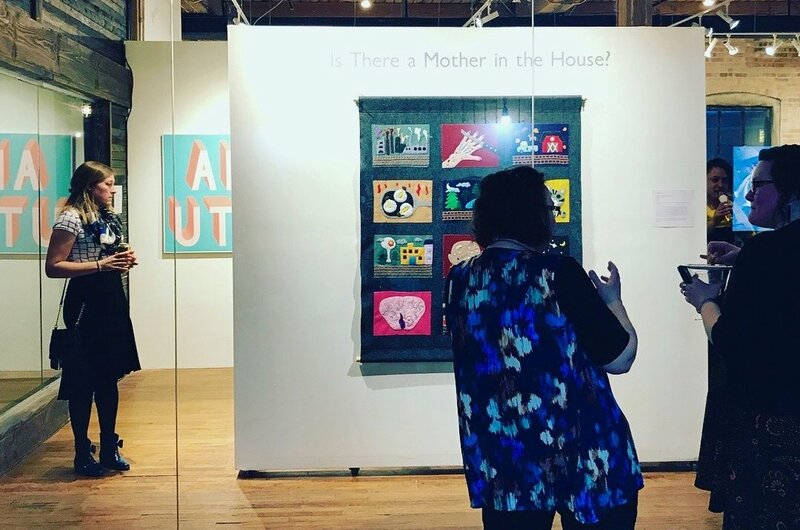 One piece of a wonderful trip to attend the exhibition, Is There a Mother in the House at Woman Made Gallery in Chicago. This particular exhibition resonates with my earlier series, Primordial Imprint. I showed two pieces at the exhibition which was joined by work from thirty other women artists from around the country. The cold and windy storm did not seem to affect the attendance at the opening and it was wonderful to meet other artists and talk with those in attendance about my work. As an artist, a certain isolation comes with the territory, so these events are important to receive feedback and see other perspectives about your own work. It was a lovely, lovely night and I appreciate all Woman Made Gallery staff did to make it such a successful evening. This is the third time I have shown here and it is one of my favorite non profit galleries. I cannot go to Chicago without going to the Art Institute of Chicago. When I lived there I literally spent every Sunday afternoon sitting in front of paintings sketching and writing. This was well before I even thought of making art a career. Years before I had started the habit of working in a sketchbook daily. This place became my retreat and oasis. On this day, I returned to one of my favorite paintings, Parisian Rainy Day by Gustave Caillebotte. I probably have more drawings in different media than any other master copy I have done. I have returned to it many times over the years. Its simplicity and mood still draws me in. I think that is what any artist seeks in their own work; to inspire people to look and linger awhile, to take a moment to touch upon that undefined moment of resonance. I always walk away inspired with a trip to this museum, now back to the studio. Having spent over 20 years in the classroom teaching elementary and middle school students my view of the world is always colored by my experience with people in their formative years. I am always hopeful. A teacher is in a completely unique position to spend the bulk of one year in the life of a child, a predictable and sustaining presence. In light of a teacher's influence, it is a great and solemn responsibility. I think most teachers just want to do their best for each student and make a positive contribution to their academic, social and emotional growth and development. I always said, "I never met a kid I didn't like." I meant it and I looked for the small things which made every child special, something that was not readily seen unless you spend 7 hours a day 5 days a week with someone. No matter who the student was, I always found it. As an artist who has often incorporated candid photos into my work I have appreciated looking at life though the lens of a single moment. When going through the artifacts of a teaching career; letters and notes, yearbooks and photographs I revisited and remembered these moments, these students. In looking back, I noted that these moments not only revealed something about the day, but the students as well. It may be a feeling of ambivalence, a show of strength, a touch of vulnerability, a glimpse into their imagination. Looking back, it was magical. I can't think of a series that I have more fun painting. My students continue to give back to me more than I could ever give to them. I am the lucky one. Images may be viewed here. Lessons Learned, opens on May 8th at the City of Shoreline gallery on the 2nd floor. The opening reception will be held from 6:30 - 8:30 on May 8th. The exhibition will run through July. Hours are 9 - 5 Monday - Friday. On a recent trip to Amsterdam I was finally able to visit the Kroller-Muller Museum, which is known for having the second largest collection of Van Goghs, including 90 paintings and 180 drawings. It's a couple of hours south of Amsterdam and not easily traveled to by bus or train, but well worth the trip. Of course, the Van Goghs were wonderful. I especially enjoyed seeing his early drawings and paintings, however, there was a hidden gem found in an artist I had never heard of. Bart Van der Leck was discovered early in his career by Helene Kroller-Muller who amassed the largest private collection of Van Goghs. She was impressed and convinced that Van der Leck's work would someday be as important as Van Gogh's. She became his patron, paying him a yearly stipend to paint and create other design pieces and had the right of first refusal on his work for several years. At first glance, this arrangement would seem to be an artist's dream, however, things are not always what they appear. Van der Leck met iconic painter, Piet Mondrian and the two of them were very much involved in the expansion of their work in a different direction. He and Mondriaan are considered the founding artists of the Dutch art and design movement, De Stijl. The abstracted lines in primary colors continue to influence design to this day. This journey towards abstraction displeased Helene and she ended the relationship, however, she had amassed hundreds of his pieces and they reside in their own wing in the museum. What fascinated me were the tracings throughout the exhibition of his process and development from realism to abstraction. His story didn't end there. We usually associate the red, blue and yellow geometric line paintings with Mondriaan alone. It was a lovely surprise to hear the other half of the story. Van der Leck may not have been as famous as Van Gogh however his contribution to the field is memorable. 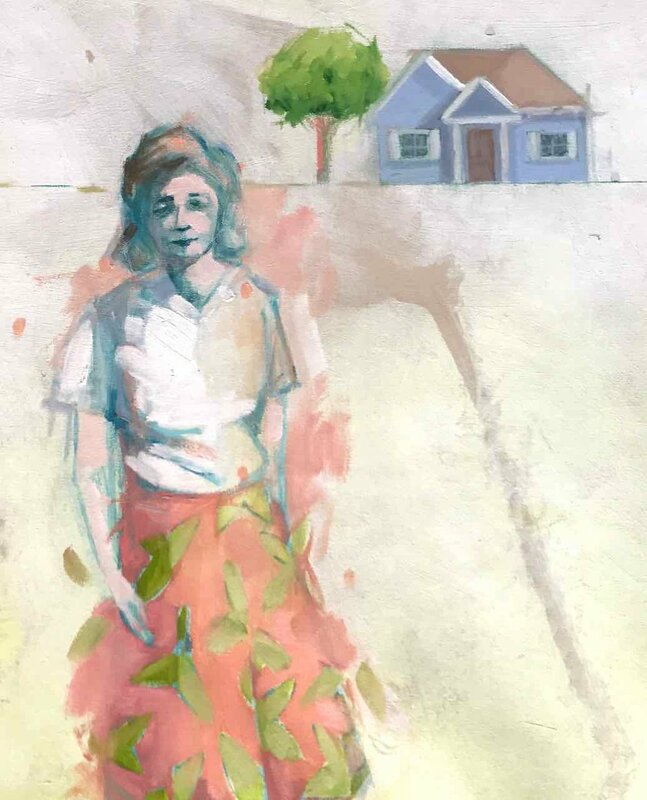 I continue to explore the idea of shift and in preparation for a residency working with middle school students I have returned to the notion of generational transition. My early work reflected my observation of the generation of parents and grandparents. As my own children have reached their early 20's the hard realization that my generation is not leaving them a sustainable world has set in. They and the generations that follow will need incredible problem solving skills, creativity and compassion to tackle their future. The cyclical nature of generation transition continues as it has throughout all time and hopefully our gift will be wisdom to know when t move aside and act as a supporting role to the generation behind. 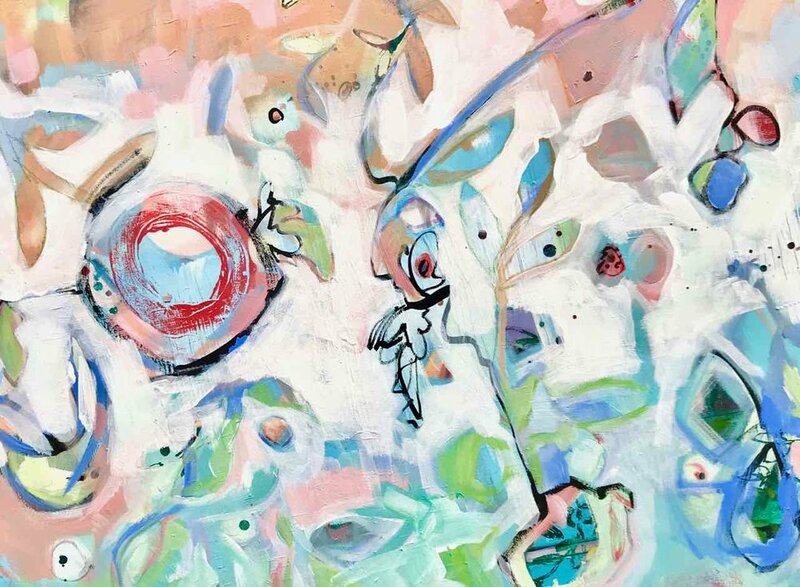 The painting below, Animate Existence speaks to the junction between planet and mortals embedded in the subtle narrative of the comings and goings of young and old. Life has shown me that change is a companion to get used to and to make peace with. While change can bring uncertainty it can also open up unexpected horizons. Much has changed since I first began my art career, leaving my teaching career and discarding my education in computer animation for painting. After the first couple of years of paying the bills, painting still life and landscapes I soon realized my voice felt disconnected from this early work. The advice of my high school English teacher still resonated with me. "Write about what you know." I realized that the scaffolding for my art was built from my life experiences. Although, life provided plenty of fodder, guarding my privacy was a bit of a hump to get over. As I found myself squeezed during the years of raising children and caring for the older generation I realized that these were very common experiences that are shared by many. My artist's voice sought expression not just for myself, but had the hope that the work would resonate with others as well. Each series unfolded from there, leading to the most vulnerable work, Terrible Beauty, an attempt to put the past's ghosts to rest. In the meantime, life presented a challenge, forging an enduring and indelible connection between life and art. Life forever changed as a result of an extended illness, two surgeries and extensive rehab. There were moments when Art literally tethered me to this life and although I had to change everything about the way I created art, I have never looked back. For those of you who have followed my work over the long run it has been a noticeable transformation and the current work may seem far removed from that early work, however, I look at it as a most amazing journey, not only the journey of my art, but of my life. I am left with only gratitude for life, the lovely spots and the difficult ones as well. The world is changing, both collectively and individually and I look forward to turning my lens to the wider world. More change to come for all of us. Peace to all. I have never considered myself a painter of landscapes, however, I have a secret stash of plenty in my studio closet that I view as my art hobby. When I travel I cannot stop myself from drawing and painting what is in front of me. When walking the dog in the neighborhood, something will catch my eye in the way the light falls or the subtle changes of the seasons. I get ideas that I usually have to and by have to, I mean, I must translate observations into paintings when I get back into the studio. Sometimes I will look to a photo, but most often paint from memory and then take over from there. I do not have a lot of time to spend on them because I am usually in the middle of two or three other projects so they are not large, 18 x 24 or less. I have noticed that one of the reasons I like to do them is there is a certain freedom and immediacy when work is done only for yourself. Working on these studies can prove meditative and probably more importantly, fun. I’ll share a few every now and then on the blog. Last summer when I was visiting my family in Ohio my husband and I stopped in the Akron Art Museum and spent some time looking at a large exhibition called Myopia. I had not heard of it but it took over the bulk of the museum so I was curious. I have a habit of going through museum exhibitions from the end to the beginning. Looking at the work without context to make my own conclusions based on the images alone. I found life size sculptures, paintings, rugs, digitally manipulated photographs and one entire room full of 30,000 postcards all organized in 300 binders. I was simply blown away by this body of work and wanted to know more. At the end, which was actually the beginning, I read the statement about the artist's difficult childhood because of undiagnosed Myopia. His vision did not extend beyond 6 inches. There was a bit about his hellish early school years which I could very much relate to because of my own learning difficulties. After reading more, I realized that he grew up in a town about 30 minutes from where I was raised in Ohio. Then I looked at the name; Mark Mothersbaugh, co-founder of Devo, the iconic punk band of the 80s. Standing there, I decided I wanted to interview him. I reached out to him this spring and he graciously agreed to an interview. We talked at length on the phone and he helped me make the connection between the art and the music, which not many know. He told me the most wonderful stories about the early days and the thread of his art always present, even to this day. He may just be a modern renaissance man. Here is the article and make sure you look at the images through the story and at the end. I was invited to jury the annual art contest for the Holocaust Center For Humanity in Seattle. I judged the high school age visual art entries, both the artwork and their statements. The theme was a quote by Elie Wiesel. “There may be times when we are powerless to prevent injustice, but there must never be a time when we fail to protest.” In light of the past 6 months it seems a most topical theme. The decision was difficult and I was impressed by the artwork and the student's thoughtful statements. Their compassion, intelligence and ability to articulate both in word and image were impressive. Perhaps the future may be in better hands. I featured it for the Huffington Post and the article is here. I have included many of the winner's images and have a link to the other film and writing winner's. Congratulations to everyone.